Who thought that turning H.P.Lovecraft's brooding cosmic horror into fodder for kids tweaking on Lucky Charms was a good idea? 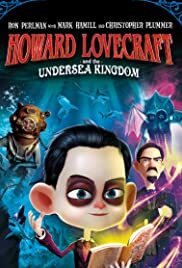 "Howard Lovecraft and the Undersea Kingdom" is a sequel to "Howard Lovecraft and the Frozen Kingdom", and as bad as the first foray into kiddie dimension hopping was, this second go-round is even worse. The use of the word "Frozen" in the 2016 first feature title was nothing more than a marketing tool to sell this substandard animated feature to unsuspecting parents at Toys 'R' Us. Now we have the terrible sequel, which has faint echoes of Disney's "Atlantis", or "The Little Mermaid" (little Howard is here seen turning into a fish and becoming an acolyte of the sea-god Dagon). Try explaining all this to your seven-year old. 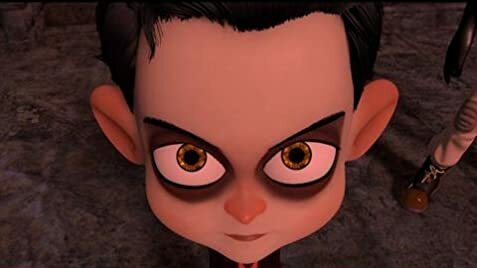 The title character, the young Howard Lovecraft is presented as a waifish snaggletoothed Goth kid complete with black raccoon eye makeup stolen from Robert Smith of the band, The Cure. Little Howie runs between dimensions trying to save his mother, his father, and his pet Spot who is in reality the elder god Cthulhu. The dread, horror, and insanity found in H.P.Lovecraft's tales of fear have been dumbed down to Scooby-Doo levels rendered in terrible animation that went out of fashion decades ago. What kid could follow, or understand the storyline here? It's all a sugary sort of nightmare in pretty colors and faint echoes of Harry Potter uttering spells that stop monsters in their tracks. I watched this simply for the same reason people slow down to see a bad accident on the freeway. Some part of your reptile brain knows better than to watch, but you do it anyway. Whoever gave the go-ahead to make a Saturday morning TV cartoon out of one of literature's greatest visionaries should rethink their career arc. This stupid exercise in kiddy occultism was many things, but magically delicious wasn't one of them.